L'Apetra est construite au sud de la Californie et elle est homologué pour la route dans la catégorie moto. Puissance moteur : 10 kW. Le tarif : moins de 30000 dollars pour les deux versions. Based on our wheel layout and our weight, the Aptera Typ-1 is registered as a motorcyle. In fact, Aptera is a motorcycle manufacturer registered with DOT and CA DMV. This means, among other things, that we are able to issue VIN's. Our 'world identifier number' is '5WT', so all of our VIN's begin with '5WT'. Knowing the public perception of motorcycle safety, we made the decision to make safety a fundamental part of the design of our vehicles. For example, the Typ-1 roof is designed to EXCEED rollover strength requirements spelled out in FMVSS 216 for passenger vehicles. The doors EXCEED the strength requirement spelled out in FMVSS 214. We decided not just to meet many of the specs for passenger vehicles, which are set above and beyond the requirements for motorcycles, but we chose to exceed them whenever possible. Just a few of the many parts of the safety systems on the Typ-1 are airbag-in seatbelt technology, a front subframe and a firewall that redirect energy around the occupants. Aptera has been working quietly with CD-Adapco and ABAQUS for several months, conducting frontal offset crash test simulations. Using these incredibly powerful tools, we are continually refining and testing our vehicles in software, performing numerous 'virtual crashes' on computers. Our next step is to corroborate the data with live crash tests.It is a much faster, and more efficient process, to use software analysis in addition to physical crash tests. We create a spectrum of virtual conditions, so that we may test the Typ-1 in every real-world environment. The Typ-1 is performing beautifully in the simulations, and we will soon upload the associated video and pictures to the website. We begin our side-impact phase sometime in the next two months, and we have a high degree of confidence that we'll see similar results. The Typ-1 uses a commoditized, 'ruggedized' 3-phase motor controller designed for vehicular applications, and a 3-phase motor made for us by a company here in Southern California. The rear drive suspension, and the drive reduction, are all designed and made by Aptera. Since the Typ-1e (electric) and the Typ-1h (series plug in hybrid) have different battery needs, this may result in different battery manufacturers for the two models. The Typ-1e is designed to use a 10 KWh pack, while the Typ-1h uses a smaller pack. The cycles and DOD are different for both applications. We will announce further information regarding the battery lifespan and warranty policy well before we begin manufacturing the Typ-1 next October. Diesel or Gasoline? Our first prototype, the Mk-0, was a parallel hybrid Diesel and achieved an average of 230 MPG at a steady state of 55 MPH. This was pure Diesel/mechanical drive with no electric assist. Diesel is attractive for its Carnot efficiency and the increased enthalpy of Diesel fuel vs gasoline. However, diesel contains lots of unburned hydrocarbons and NOX compounds, and it's impossible to get a small Diesel engine certified for emissions in California. Therefore, the typ-h uses a small, water-cooled EFI Gasoline engine with closed loop oxygen feedback and catalytic converter. This engine is coupled to a lightweight 12KW starter/generator. It's very clean and quiet. 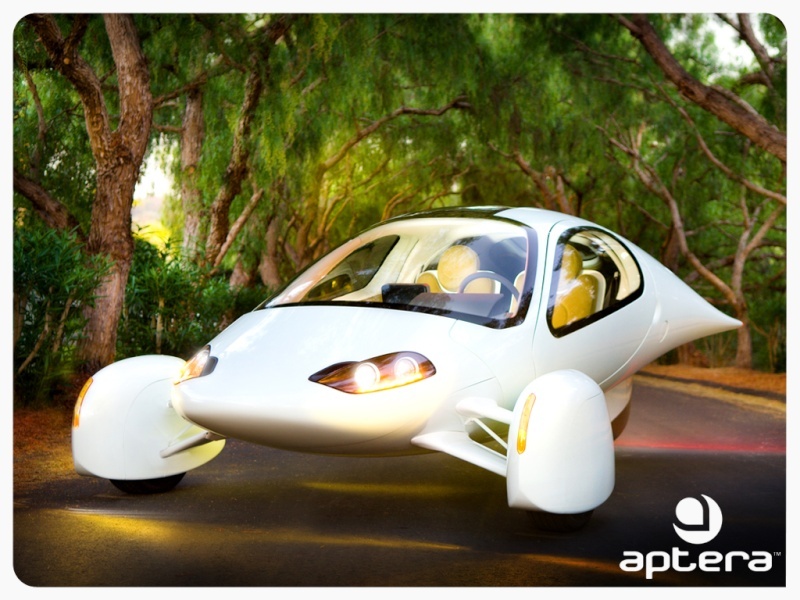 With the All Electric Aptera, it is very easy to figure out the mileage range. The mileage is determined by the distance you can drive, under normal circumstances, until the batteries are effectively drained. In the case of the first Aptera typ-1e, we have calculated the range to be about 120miles. With the Plug-in Electric Hybrid version of the Aptera(typ-1h) the mileage of the vehicle is difficult to describe with one number. For example, the Typ-1h can drive 40 to 60 miles on electric power alone. Perhaps for such a trip, the engine may only be duty-cycled for a few seconds or minutes. This would produce a fantastic number, an incredible number that, though factually true, would have no useful context, i.e. it's just a point on a graph. An asymptotic decaying exponential is an accurate way to describe the fuel mileage of the Typ-1h. For example driving say, 50 miles, one might calculate a MPG number that's 2 or 3 times higher, say, 1000 MPG. As battery energy is depleted, the frequency of the engine duty cycle is increased. More fuel is used. at 75 miles, the MPG might be closer to 400 MPG. Again, we're using battery energy mostly, but turning the engine on more and more. Just over 100 miles we're just over 300 MPG, and just beyond 120 miles, we're around 300 MPG. So why pick a number at 120 miles? Well, it's more than double of most available plug-in hybrid ranges that achieve over 100 MPG. It's three times the distance of the typical American daily commute. It's a meaningful distance that represents the driving needs of 99% of Americans on a daily basis. Sure, it's asymptotic, after 350-400 miles it eventually plummets to around 130 MPG at highway speeds where it will stay all day until you plug it back in and charge it up.